On this web site, I'll be including my most recent paintings as I finish them. 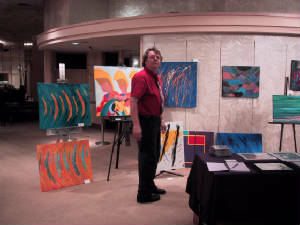 Recently I have been working with primarily color using both abstract and primitive painting styles. Look for upcoming works, including "Rastafarian Beach Party" in this space in the next few weeks. Above is a photo from my latest showing, which was held at the Jacksonville Landing near downtown Jacksonville. 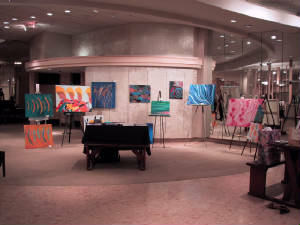 Every month (the first Wednesday) Jacksonville holds an "Art Walk" where the public is invited to take a tour of local arts and craft works. It's free and a lot of fun and over the past few months, it has been highly successful! Way to go Jacksonville! Do you need a painting to fit an exact size, using specific colors to fit a room or space in your home or office? Call me at 904.349.5853 and we'll customize a painting to fit your needs. Here I am, looking a bit bewildered. Who ever said art isn't fun?